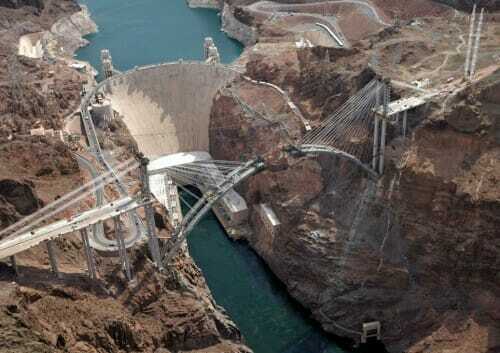 The new bypass bridge at Hoover Dam. Photo courtesy of the Mail Online. I trust your comment is tongue in cheek? That is pretty dang cool. But I am in awe of stuff like this. I think I've found my new wallpaper. How so? The dam is a two-lane road, probably has a low speed limit and - from the picture - you'd have to drive down a windy road to get there, then back up another one. This bridge has quite a bit of utility for Nevada tourism. I doubt that trucks will be allowed to travel on it. John can probably attest to the wait times going over the dam, 1-3 hours most of the time. Yes, there are very low speed limits along the long, winding path. There are frequent pedestrian crossings that stop the traffic. I think they've been working on this bridge for at least 10 years now, hope it's done this decade. No, the bridge has not been in development that long. It was started in 2005 and is still on squedule to be finished by 2010. You can read all about it at http://www.hooverdambypass.org/ with time schedules and construction photos and more. In my opinion it's a good project. yeah, it's a good idea, a good project, will clear out a lot of congestion and all that. the problem is that, even with all the engineering problems inherent in building it, it's still just a *bridge*. a bridge that's taking longer to build than it took to win world wars 1 or 2; that's taking more time than it took to build the dam itself, IIRC. even worse was the rationale for finally getting it built: there had been hours-long traffic backups at the dam for decades - it's the main road between phoenix and vegas, funneled through a 15 mph 2-lane narrow road, so guess how weekend traffic was - and the powers that be merely yawned: it's not like they were having to *pay* the proles stuck in traffic for their time, after all. screw 'em. then came 9-11! emergency! gotta protect the dam from the terrorists! it's the primary water supply for the entire west!! we must move quickly, like a cobra!!! like the wind!!!! a mere 4 years later, they got around to *starting* construction. just outta curiosity, do you suppose the bridge will come in on time and under budget, like the dam itself did, or...maybe....a few months late and a few hundred million over, like the dam's recently-built 'visitor center' was? it'd be smart to bet the 'over', since a quick google search reminds me that this "on schedule" project was *originally* supposed to be up and running - uh... - LAST year. but they ran into problems, see, and since that's never happened before in the history of construction, we now have a NEW schedule that we're on target to hit clean through the revised and adjusted bullseye! it's a good project, to be sure. it's just that it's 40 years late and being constructed by the bobo the clown bridge company. There was a multi-episode show about building the supports,[anchorages?] getting the uprights installed and starting to string the suspension cable on History or Discovery in the past 6 months or so. Extreme Engineering? Dangerous Jobs? Can't remember. As to delays, I wonder how many tons of paper were consumed in determining the legality of the construction from the point of view of EPA, green, save the river, destroy the dam, and everyone else that wanted to have their say. One might think more paper was consumed in the lawsuits than in the design... Back in Hoovers day, they just went ahead and built the dam[thing]. Good thing the government hasn't screwed up the engineering field. Yet. I cannot speak to what level of congestion is typical on the existing road over the dam. But, at the moment the photo was snapped, there was clearly nothing on the order of an hours long wait to cross the dam. That said, other commentators offered valuable perspectives.